What is Minocycline? What is Minocycline used for? Minocycline is tetracycline class of antibiotic that fight bacteria in the body. It is used for treatment of different bacterial infections in the body such as: respiratory infections, urinary tract infections, skin infections, gonorrhea, severe acne, tick fever and chlamydia infections. Minocycline is available in following forms: oral tablet and capsule, injection, topical foam, medicated topical pledget and periodontal powder. It is available in following doses: 50 mg, 75 mg and 100mg. Minocycline is the most liposoluble and most active tetracycline antibiotic. It is a long-acting tetracycline just like doxicycline. Minocycline inhibits protein synthesis. Minocycline can pass directly through the lipid barrier of bacterial membrane or it can diffuse passively through porin channels in the bacterial membrane. Minocycline then binds to the 30S subunit of ribosomes, thus preventing the tRNA binding to the mRNA-ribosome complex and interfering with bacterial protein synthesis. Minocycline tablets should be used by mouth with a full glass of water. Patients should follow the directions on the prescription label. Minocycline should be taken at least 1 hour before or 2 hours after meals. If it patients get stomach upsets, then it should be taken with food. Take your medicine at regular intervals. Patients should not take Minocycline more often than directed. Do not skip doses or stop your medicine early. Patients should talk with their pediatrician regarding the use of this medicine in children. Special care may be needed. Can you drink alcohol on minocycline? Some minocycline indications such as acne require a long term treatment of several months, which is for sure a long period and a lot of patients may be concerned if they will be able to consume any alcohol during this period of time. The general health care recommendation is that patient have to avoid any alcohol during antibiotic therapy. If minocycline is used together with alcohol only occasionally and in moderate amounts there should be no particular interactions. However, alcohol consumption can increase the probability of developing side interactions and adverse effects, especially those which are linked with CNS. Dizziness, drowsiness and vertigo can be caused by minocycline in some patients. Such patients should avoid driving cars or operating machinery. Alcohol can add these effects or make them more intensive. 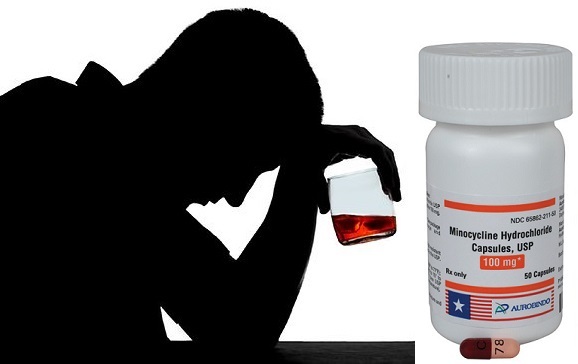 Also, minocycline administration can make patients to become less tolerant to alcohol and feel “drunk” even after consuming moderate quantity of alcohol. This is why it is always the better option to avoid concomitant use of minocycline and alcohol if these combination causes side effect. In general, all minocycline side effects can be significantly increased by alcohol. Nevertheless, avoiding alcohol could be very important in acne treatment as alcohol use is also not recommended while patients are treated for other serious infections. Also, patients who have some liver disease or dysfunction should avoid alcohol and minocycline as both substances are metabolized by the liver and they can be very harmful for the liver if they are taken for a long period of time. Retinoids + Minocycline: Retinoids are vitamin A derivatives such as acitretin (Neotigason) or isotretinoin (Roaccutane) which are mostly used for acne treatment. These drugs and minocycline should never be used at the same time or short after or before minocycline administration, as they can lead to the development of a dangerous health condition known as pseudotumor cerebri or intracranial hypertension. Its symptoms include nausea, vomiting and headache. Antiepileptic drugs (phenytoin or phenobarbital) + Minocycline: These drugs are inducers of liver enzyme that can lower the effectiveness of minocycline. Blood thinners such as warfarin (Coumadin) and sulfonylureas such as glipizide and glyburide + Minocycline: These drugs can increase minocycline effects and make stronger side effects. Antacids, iron and aluminium preparations, calcium supplements, and cholestyramine + Minocycline: These preparations can interfere with minocycline absorption. Penicillins (Amoxicillin, Augmentin) and cephalosporins (Ceftriaxone) + Minocycline: Minocycline can decrease their efficiency. Methoxyflurane (Penthrox) + Minocycline – there is a risk of kidney toxicity. Oral typhoid vaccine + Minocycline: A 24 hours interval between administering the vaccine and minocycline should pass as it can interfere with its effect. Ergot medications such as Ergotamine + Minocycline: This combination may cause increased risk of ergotamine side effects. Digoxin + Minocycline: This combination can increase digoxin blood concentration in approximately 10 % of the patients. Minocycline should not be used during pregnancy. It could harm the unborn baby or cause permanent tooth discoloration later in life. Minocycline has been assigned to pregnancy category D by the Food and Drugs Administration (FDA). This means that there is clinical data about teratogenic effect on people and animals. However, in some serious or life-threatening conditions the expected benefit can outweigh the potential risks for the fetus. Minocycline can lower the effects of birth control pills. Patients should talk with their doctor about using a non-hormone method of birth control to prevent pregnancy while using Minocycline. Minocycline can pass into breast milk and may negatively affect bone and tooth development in a nursing baby. Patients should never take these drugs during breastfeeding. Children should also not take this drug. In children younger than 8 years Minocycline can cause permanent yellowing or graying of the teeth. Patients should not take iron and calcium supplements, multivitamins, antacids or laxatives 2 hours before or after taking minocycline. These products can make this medicine less effective. Always check if expiration date on the label has passed. Expired minocycline can cause damage to your kidneys.